The Irish Gift House: The Irish Gift House features Irish and Celtic jewelry from Solvar! The Irish Gift House features Irish and Celtic jewelry from Solvar! 2016 marks the 75th anniversary of Solvar Jewelry! For several generations this Irish family owned business has been one of the leading manufacturers and exporters of Irish jewelry and has won multiple awards along the way. The extensive range from Solvar includes Claddagh rings, Celtic rings, Celtic cross necklaces, Celtic jewelry, shamrock jewelry, St.Brigid's crosses and more. Their annual catalog typically features over 1,000 current jewelry pieces and they offer their jewelry in precious metals such as gold and silver and they also offer plated pieces too. Solvar additionally offers many of their designs with stones that range from diamonds and emeralds to crystals and has a beautiful collection of Connemara marble jewelry. Not only does Solvar offer several choices in metals and symbols, but they are also famous for the diversity of their product lines. 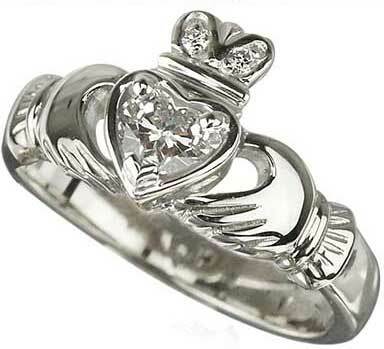 For example in Sterling silver alone Solvar offers Claddagh jewelry as rings and bands, brooches, earrings, necklaces and pendants, charms and beads, bracelets and bangles, and cuff links! Solvar offers the finest in traditional Irish jewelry featuring all the classic designs and they are also innovative with their new product development that often emulates the current trends with an added Irish or Celtic twist. Every year we receive a visit from our Solvar representative and it often takes 3 to 4 hours just to see the newest product. The new products are next proudly added to our site and the orders never seem to stop! The Irish Gift House is proud to say that Solvar has been our principle Celtic and Irish jewelry purveyor for the past 18 years. Ever since we launched theirishgifthouse.com in 2005 we have made it our goal to feature every available piece from Solvar on our site. Today you will find about 2,000 different and often unique pieces of Solvar jewelry on our site and we have almost every piece is in stock for quick delivery.